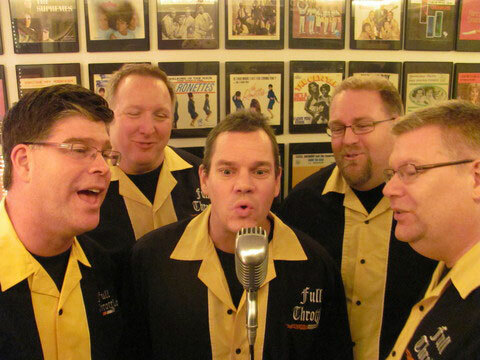 Full Throttle has been entertaining audiences for over 5 years with well-tuned vocal harmonies and a great sense of humor and style. Our dedication to the doo wop style and song originality of the 1950's and 60's, takes you back to the days when 'sock hops' and 'cruisin' was all the rage. We'll make you want to get up and dance and sing along to the songs you remember from "back then" with a mixture of classic songs sung by groups such as The Cadillacs, The Tokens, The Del Vikings, and Dion and The Belmonts..... just to name a few!